Choose a classification folder with four, six or eight parts to meet your needs. 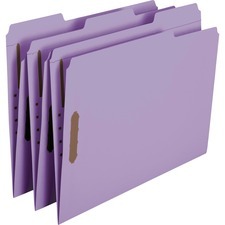 Durable pressboard covers with fasteners provide snag-free document filing. Color-matched, reinforced Tyvek® expandable file gusset ensures long-term use. Tabs for titling included on covers and dividers. Classification Folder Type: Top Tab; Size: Letter; Number of Sections: 8; Cover Material(s): 25 pt. Pressboard.